​Custom Design and Machining (CDM) is a small machine shop in a small town in Utah…but that is where small stops. The company has very big capabilities and talent. Co owner Brad Gardner knew from a very early age that he loved machining. He learned the fundamentals in high school, back when they still taught shop in high school. Then he went on to Utah Technical College at Provo (now Utah Valley State University). Brad’s skills were so advanced that he was made shop foreman for the college program. ​In 1980, Brad, a young married man just out of school, had to find work to support his family. Brad says, “I went to Volt Manufacturing, and met with the owner, Phil Sigler. I asked him for a job, and he said he wanted a guy with more experience. ” Brad says, “So I asked him ‘just how does a young machinist get more experience if nobody will hire him?’” Apparently this worked, as he hired Brad to start working immediately. At the young age of 33, Brad made the leap from employee to business owner. He started his first business with a partner, and subsequently went out on his own when a customer asked him to open a new machine shop. He named it Custom Design and Machining (CDM) in memory of his father in law, who owned a grocery store called C&D’s. ​​Today, the company, a woman owned business, offers machining (mill and lathe), wire EDM, as well as manufacturing design assistance. Its customers range from Fortune 100 companies to small rural farmers requiring farm equipment repair, to inventors. It offers Kanban for inventory management for its customers that request this. CDM is truly a family owned business, with Brad and his wife Tracy, and two of their four children Hagen and Tandi, active in the business. ​Brad utilizes an interesting method for evaluating best in class machinery. He says, “I look to see what is on the used market. 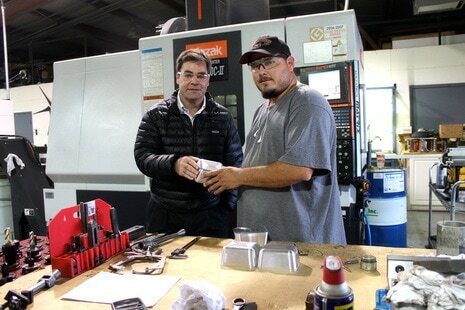 When you find a machine tool brand, and there are a number of machines, just a few years old, that are already on the market, you have to wonder why.” He continued, “You just don’t find Mazaks on the used market often, and this speaks to their strength.” Brad additionally values the fact that he is purchasing Japanese machines that are made in America when he buys the Mazak VCN 510C Vertical Machining Centers. Brad and his team couldn’t be happier with their new Mitsubishi wire EDM purchase. He says, “For one, we were surprised with the ease of use with the wire EDM. Additionally, we received excellent training from Smith Machinery. It consisted of 3 days of set up and on-site training. Then we ran the machine at our shop for one month, after which we received additional training.” He continued, “Smith Machinery and Mitsubishi really took care of us.” The team at CDM was particularly impressed with the Mitsubishi talent and resources, noting that there are 14 technicians across the west coast available to support them immediately with training and repair. they are a superior choice.